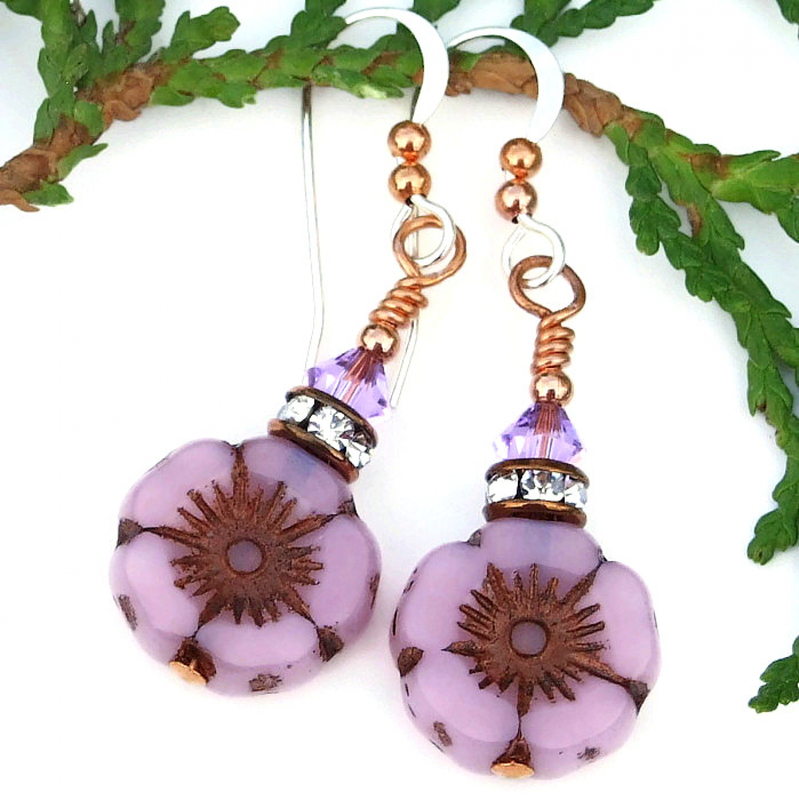 The size of the PRETTY PINK POSIES handmade pansy flower earrings might be on the smaller size, but they definitely pack a perfect punch of fashion sense! 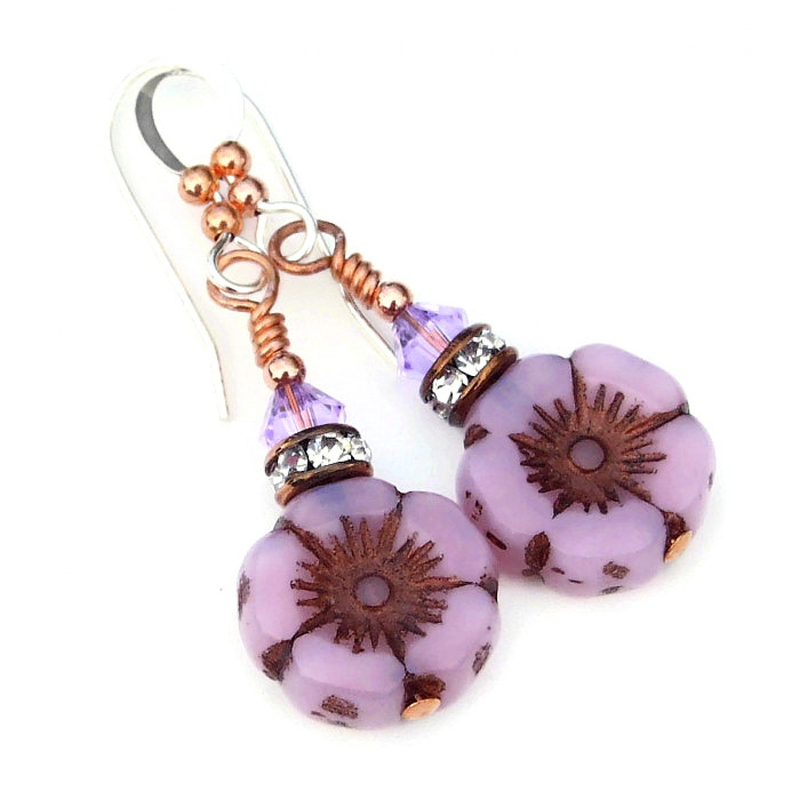 Captivating jewelry to wear on those sunny spring and summer days, the one of a kind earrings feature two-sided pink opal glass flower beads made in the Czech Republic. 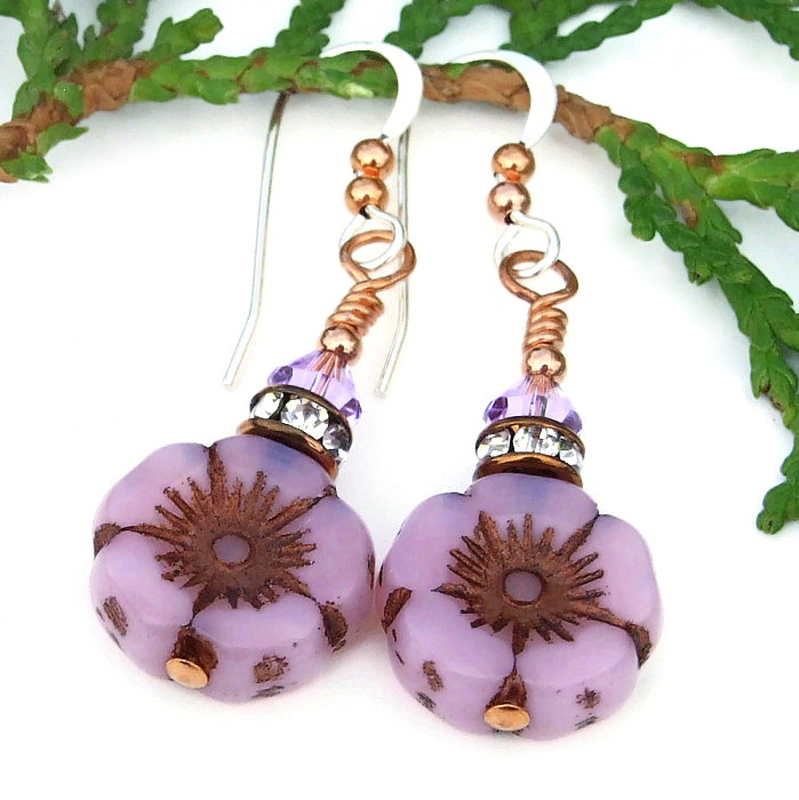 Because of the opal-like quality of the glass, these earrings positively glow when worn. During the formation of the beads, a metallic copper Picasso finish was applied to bring out the exquisite detailing of the beads and to give them a vintage look. 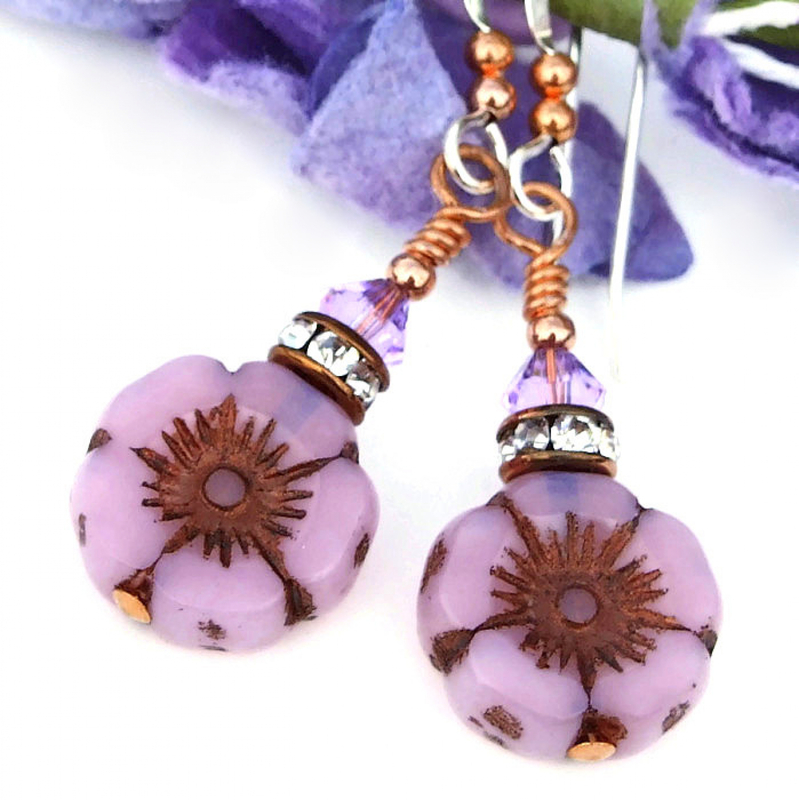 The finish was then polished off, leaving the metallic copper in the center of the pansies, to delineate each of the five petals and on the edge of each bead. 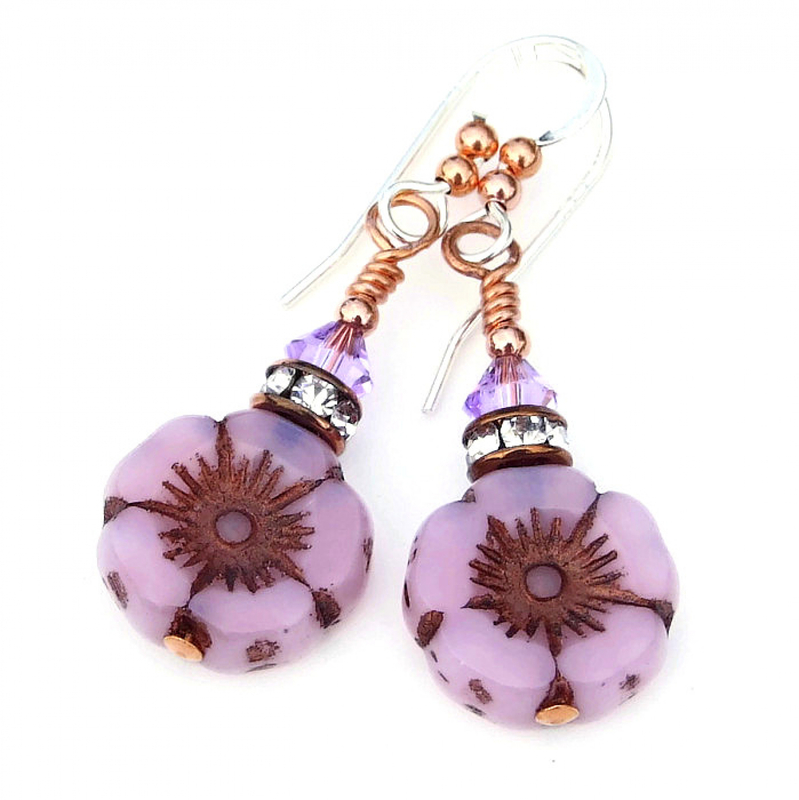 Since the flower beads are two-sided, these earrings are attractive from any angle. 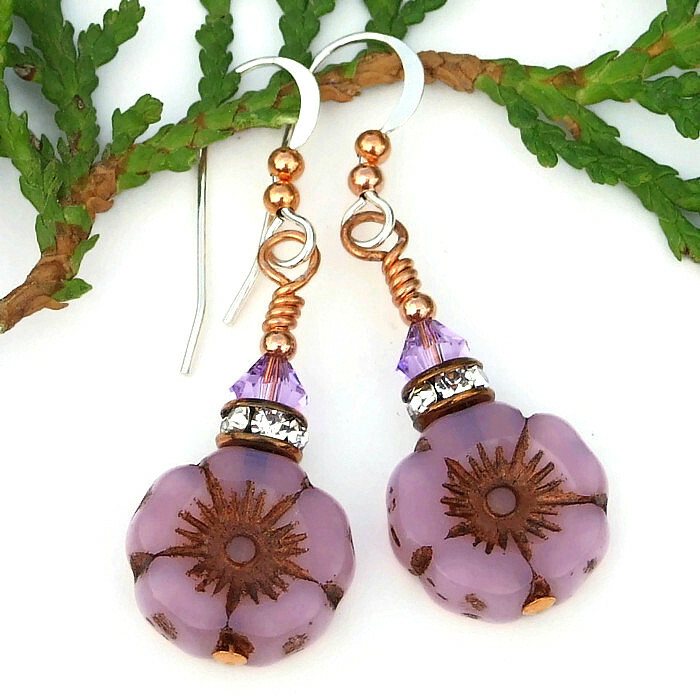 To add eye catching sparkle to the overall earring design, two types of crystals were used. 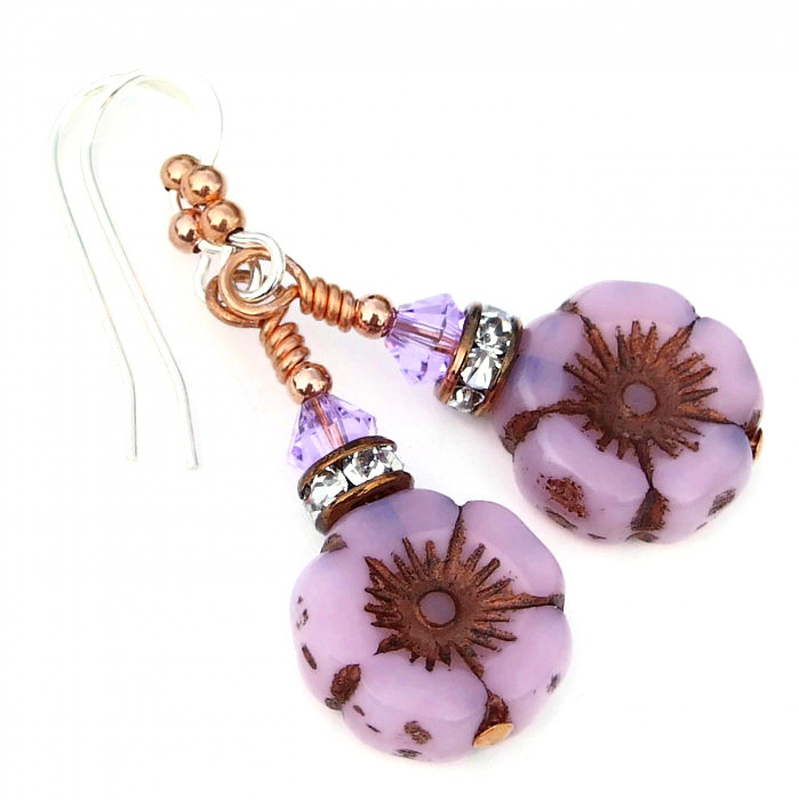 Perched on the flowers themselves are Czech copper rondelles set with small, sparkling clear crystals. Seven crystals make up the rondelles, adding amazing dazzle. For even more glitter, a small faceted Swarovski crystal bicone was snuggled into the top of each crystal rondelle. 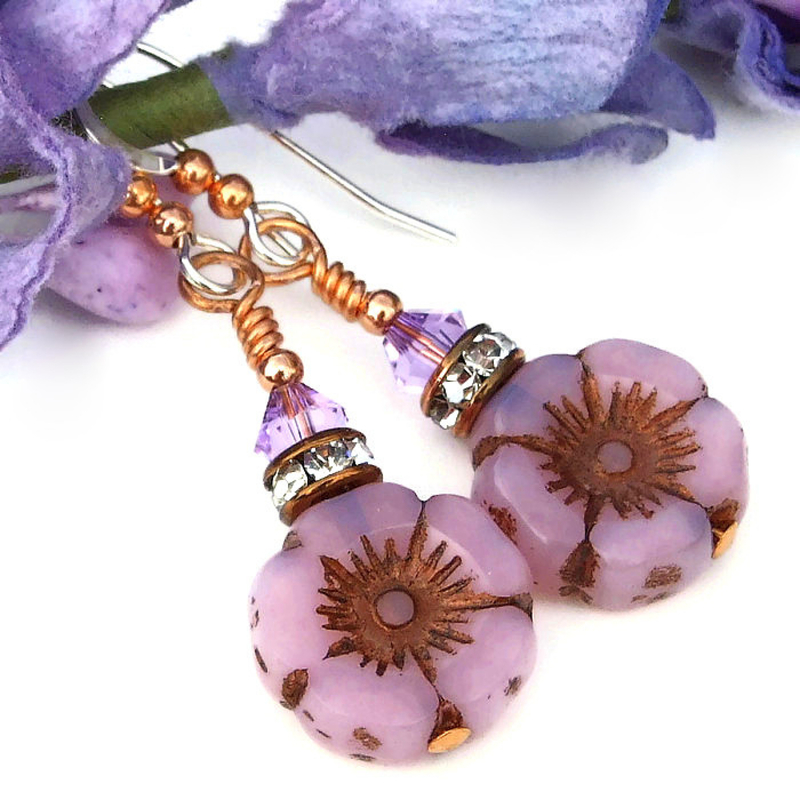 The color is called “light amethyst,” a lovely pale purple highlight to the pink opal color of the pansy flower beads. 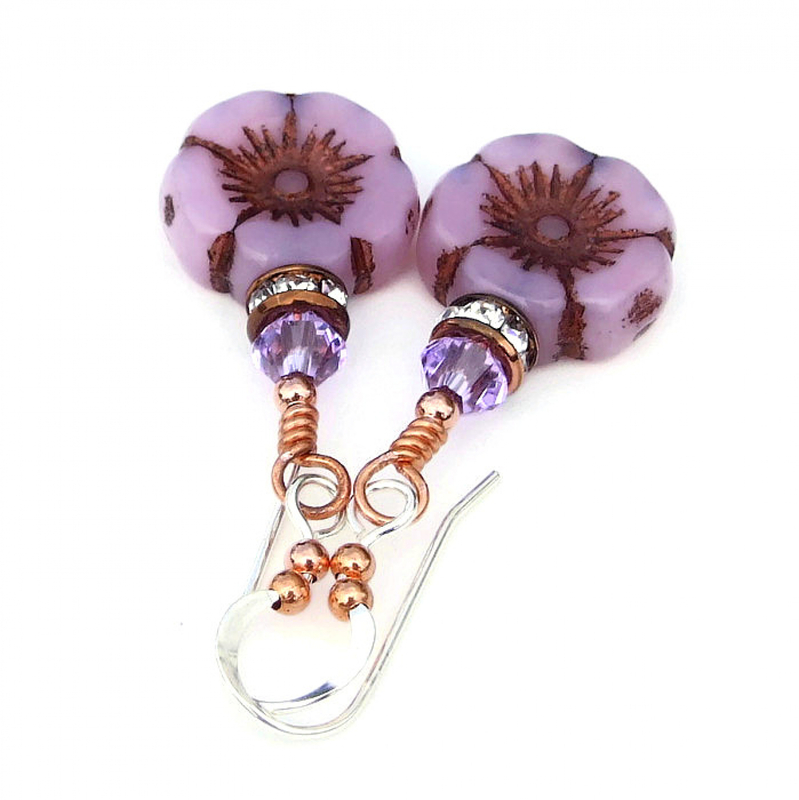 Sterling silver French hook earwires with copper bead accents finish the earrings perfectly. 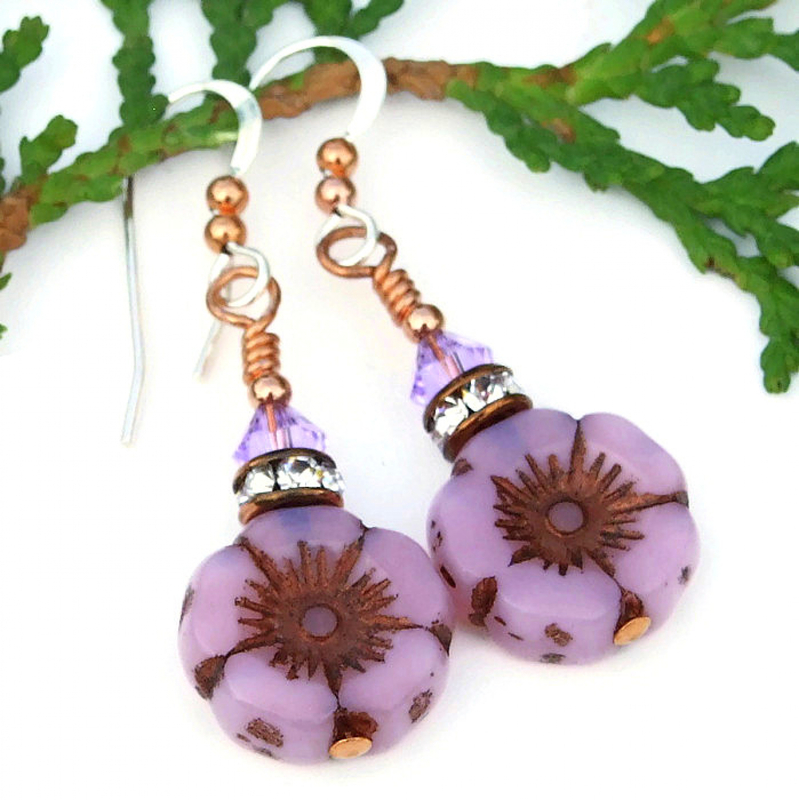 Carefully designed and handmade by Catherine of Shadow Dog Designs, the PRETTY PINK POSIES are a meaningful gift for Easter, Mother’s Day or a birthday for the woman who loves unique flower jewelry. 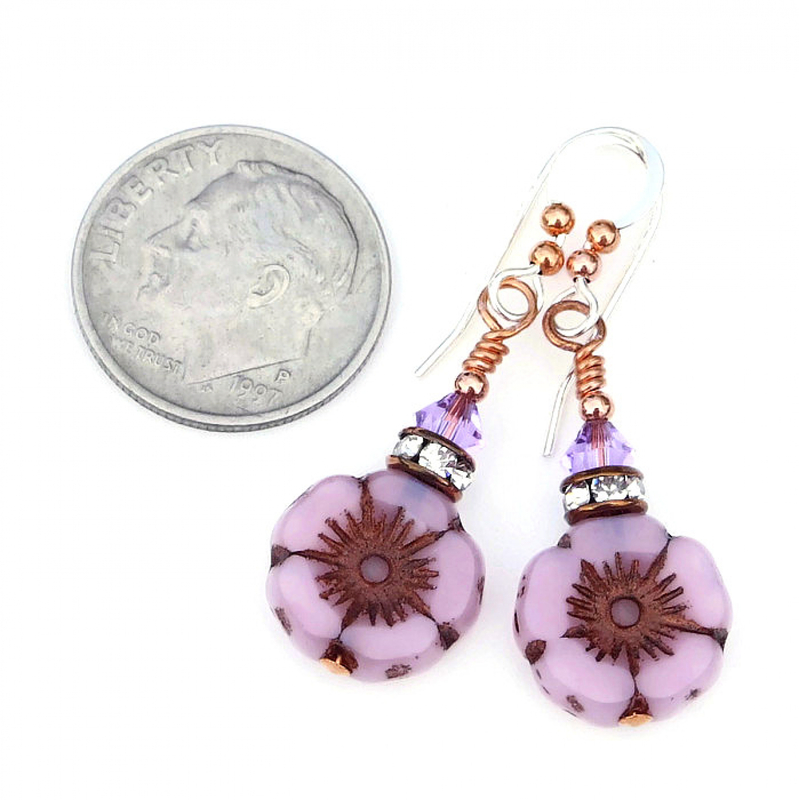 *** For a better understanding of the relative size of the PRETTY PINK POSIES flower earrings, please be sure to check out photo # 6 for a size comparison with a dime. 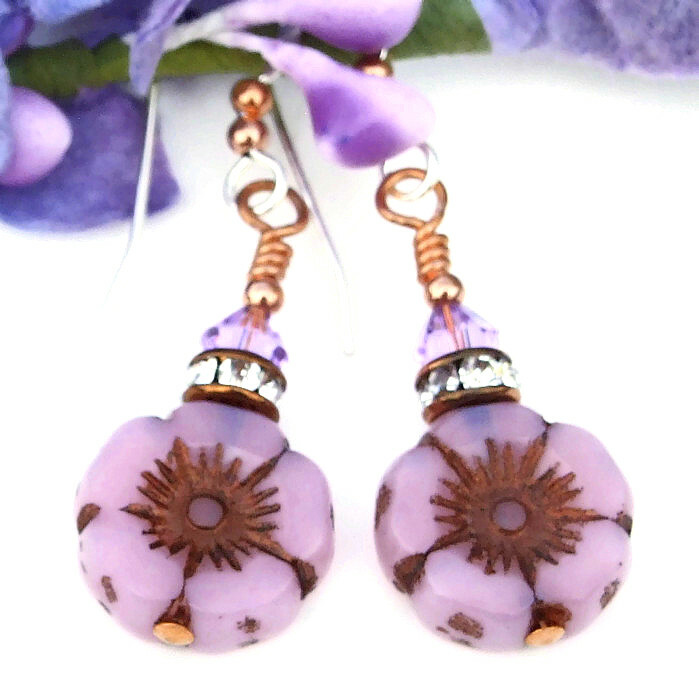 The PRETTY PINK POSIES artisan earrings were carefully designed and handmade in a dog friendly, smoke free studio. They will be carefully packed in an organza jewelry bag with tissue, perfect for gift giving to a loved one . . . or to yourself! *** Photos of my jewelry are taken outside in natural light. The colors of the items used to create the jewelry are extremely close to the actual color on my own computer monitor. Please be aware that not all monitors show colors exactly the same. The colors may appear lighter or darker on your monitor.